Has anyone had a Tunnock's anything before? Luuuve the colours of this one. Nope. Never even noticed this logo, even in my trips to England. I will look for this next time, though. Gotta say I like a Caramel Log more than a Caramel Wafer. I'm hoping some goodies fell off the back of this? @RowerJ The Rev's really put me in the mood for these. Think I'll go buy a packet at lunch. yes, yes I have. though I dont remember them that big even if that is an 8 pack. i thought for a moment that was your face in the logo. that would have been something. this takes me back to my childhood. haven't had one of these in years. No, but I can already tell that I really want to. Caramel and chocolate. Okay. Nice shot to. This reminds me of a story in my family. When my father was very young, less than 10 years, my great grandfather came to visit. He made a simple request, he had a craving for biscuits. My grandmother obliged, with some the best biscuits she knew how to make. 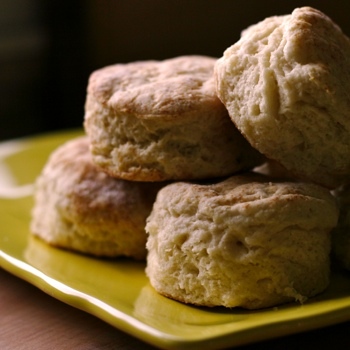 When presented with this southern delicacy (clame), my great grandfather apparently flew off the handle, exclaiming something like "what the hell are these, I asked for biscuits!!!" Our American biscuits don't have a ton of anything, let alone taste. Very jealous. @dj That is a great story about your grandfather. I do like British biscuits, but I much prefer American biscuits with gravy goodness. this is my favorite for the day. dairy king fav'd at that!